In October, I embarked on a self-guided 30 day yoga challenge to help sooth my emotions surrounding our recent move to Montreal. My intention for the month was to grow roots in this new city, begin to feel like I belong somewhere, let go of my fears and embrace the longing I had to return home to Alberta. To help me stay focused, I decided to keep an online journal of my experiences each step of the way. A week or so into the challenge I learned that the yoga studio I attend, Moksha Yoga NDG was planning to do a 30 day yoga challenge in November, too. I signed up without a second of hesitation and was later asked to help create some yoga challenge inspired meals for my fellow yogis. Participate in a second yoga challenge, and contribute to my new community? Things are coming together! This recipe is the first of four recipes I’ll be sharing on the blog this month that I hope will inspire us challengers to take our commitment to the next level. For many of us, committing to this yoga challenge has meant much more than heading to a yoga class once a day. It’s about treating our bodies with respect, injecting love into our lives, finding peace in any storm, and participating in nourishing actions that will feed our soul. With that in mind, this week’s recipe is centered around being good to your body. and I’m certain that you can, too! 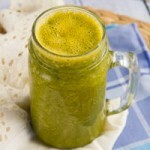 A smoothie made with fresh veggie juice and blended with a healthy dose of spinach and ripe pear. 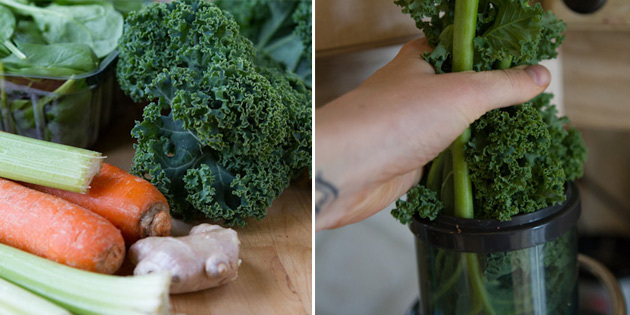 If you have a ‘low’ setting on your juicer, begin with the softer items first – kale. Then turn to ‘high’ and juice the celery, carrots and ginger. 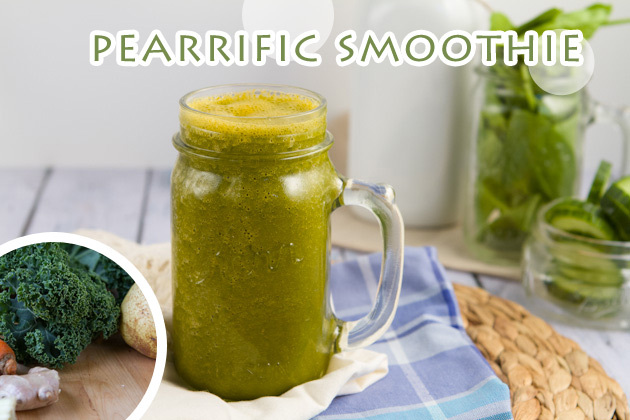 Place fresh juice in the blender with spinach, pear slices, chia seeds and ice cubes. 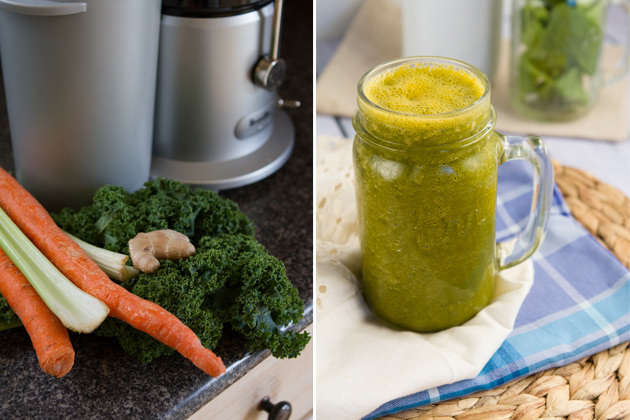 If you want a brighter green smoothie, remove the carrots and replace with cucumber instead. The end result was still green, but it had an odd tinge to it. 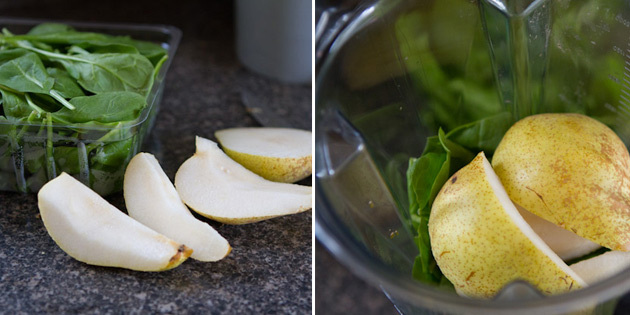 You could also just juice everything, but I liked that I was still getting the fiber from the pear and spinach instead of juicing all of it away. 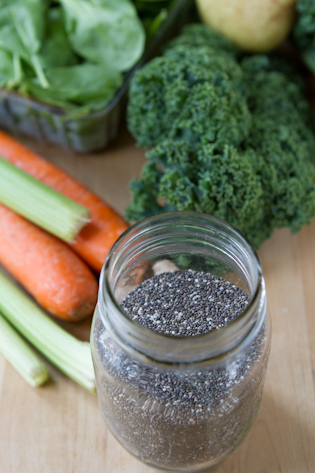 Adding chia, flax or even hemp seeds would go fabulously in this smoothie and help to keep it from separating, too. 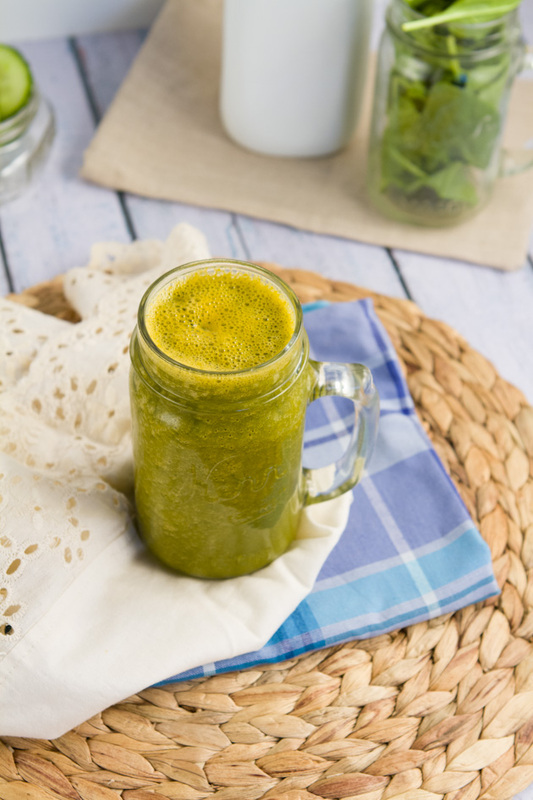 Not to mention it pumps up the healthy fats and protein in this delicious drink. What’s your favorite smoothie add-in? Are you visiting from the challenge? How is it going for you? What meals have you been preparing to support your body through the challenge?